Over the past week or so three new Samsung smartphones got leaked. 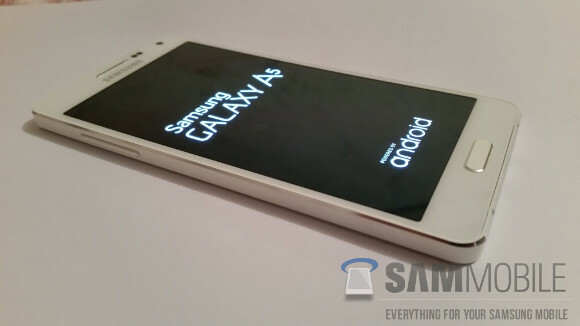 These bear the model numbers SM-A300, SM-A500, and SM-A700, and they will probably launch as the Galaxy A3, Galaxy A5 (pictured below), and Galaxy A7, respectively. Now we have some rumored price points for each of them, along with some interesting details about the A7. It turns out that this particular device may only be launched in select countries, and not become widely available as the other two. Since its name and model number both seem to imply that it will be the best specced out of this trio, such a decision by Samsung is intriguing for sure. It may be that the company doesn't believe in the Galaxy A7's prospects of selling well everywhere. Or we could be looking at the exact opposite - it being afraid that the A7 would eat into the sales of the Galaxy Alpha. Either way, the Galaxy A7 is said to cost around $450 to $500. The Galaxy A5 will be priced at $400 to $450, while the Galaxy A3 will be the cheapest of the bunch at $350 to $400. All of these prices are obviously for unlocked models. All three Galaxy A handsets are going to feature built-in LTE connectivity, and they could all get official by the end of this month. They should have similar designs to the Galaxy Alpha as well as a premium feel, though whether metal will be used to achieve that is not yet clear. Buy what satisfies your needs. Don't believe ever opinion your read.The A series is a good set of phones and you will never go wrong in making that decision. LG is a crappy phone with poor quality .